In the last couple of years, there has been an inclination towards offbeat piercings among youngsters for expressing a personal style. 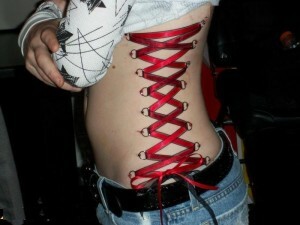 A unique type of surface piercing, corset piercing involves multiple piercings placed side by side on any part of the body, preferably the back in most cases that are often laced together as it is done when wearing a corset. Since it is subjected to risks, many opt for a temporary piercing, lasting for a short period. Many piercing salons are not ready to conduct the process as it is a complicated piercing. Do not get it done unless you find a licensed piercing studio having professional piercers with hands on experience in this style of piercing. Decide about the number of piercings you would want before the procedure. The piercing is placed at the desired location using a sterilized, hollow needle after a thorough cleaning with an antibacterial solution. Having a high threshold for pain makes it easier to go through the process without getting much hurt. Although it is a surface piercing, multiple perforations are bound to cause a lot of pain, irrespective of the location. Bruising, swelling and reddening around the piercings cannot be ruled out. Although permanent piercing may take nearly 12 weeks to heal, complete healing has been witnessed only in few cases. Taking utmost care of the piercing poses several challenges, the location being one of them. As a result, it carries a higher chance of getting infected. Moreover, the greater the number of piercings the lesser are the chances of undergoing complete healing. Migration and rejection are commonly associated with the piercing, especially if it is laced with a ribbon, leading to unnecessary pressure on the pierced area. Incorrect placement of the jewelry or incomplete healing increases the risk of scarring. Temporary piercings also hold the same risk of infection and skin irritation. However, they are done in such a fashion that facilitates earlier rejection, eventually leading to migration. In the case of temporary piercing, ball closure rings or captive bead rings are used to put a greater amount of stress, causing rejection within a week or two, thereby reducing the risk of scarring. Hypodermic needles are used for certain occasions requiring you to display the piercing for only a few hours. While it is a bit difficult to make it a permanent piercing, wearing surface bars, slave barbells or doorknocker, Teflon barbells, or Tygon tubing can be less stressful on the piercing, lowering the chances of rejection. 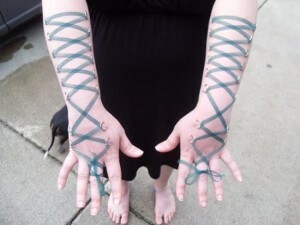 Once the pierced surface heals, you can creatively lace the multiple piercings with a ribbon, chain, or rope. The price of the piercing usually varies between $100 and $500 depending on the length and location in most reputable piercing studios. The piercings are placed in two rows either on the upper or lower back, resembling a corset when laced together. Here, the piercing is done on any part of the neck, including the nape. 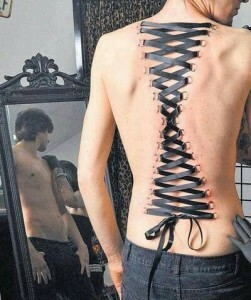 Although it does not look as spectacular as the back piercing, you can give it a try. 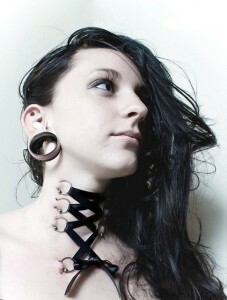 A less aesthetically-pleasing piercing, it involves multiple perforations of the shoulder or wrist. 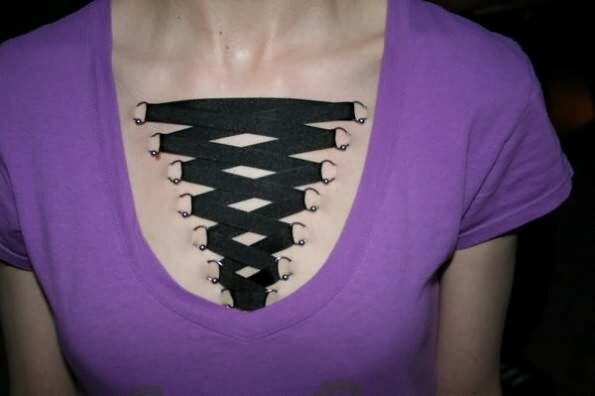 While the piercing is placed on one side of the torso, some piercing enthusiasts go for both the sides. It is a bilaterally symmetrical piercing done on the chest adorned with colorful ribbons. Several piercings placed on the front or back of the legs makes a unique fashion statement, especially when you wear short skirts or shorts. 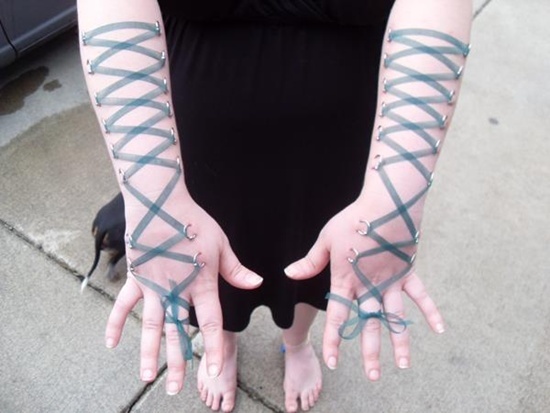 Sometimes, the piercing is done on the foot. Here, microdermal implants are embedded in the skin for attaching the jewelry, lending it a decent look.